The Colored Musicians Club will be celebrating its 100 year annerversary with a week long festival from July 24 to July 29, a total of 150 performers will be seen gigging around the city. Some events take place at the club, located at 145 Broadway, at the corner of Michigan Street. Others locations range from the Albright-Knox Art Gallery to tiny Pausa Art House, in Allentown. July 24: Festivities kick off at 6:30 p.m. with a Slow Roll community bike ride starting at the Colored Musicians Club (145 Broadway). For details, visit slowrollbuffalo.org. At 7 p.m., CMC president George Scott leads his big band on the CMC stage. Both events are free. July 25: At 5 p.m. Food Truck Tuesday at Larkin Square welcomes the combo led by saxophonist Carol McLaughlin. Free. At the CMC, award-winning French jazz violinist Scott Tixier performs with his quintet at 7 and 9 p.m. $30. July 26: At Buffalo Place downtown, at an indoor stage at Fountain Plaza by the ice skating rink, the Jenny May Quartet plays at 5 p.m., a trio led by pianist Ed Chilungu plays at 6 p.m. and the Alex McArthur Quintet follows at 7 p.m. Free. Also on July 26, at Larkin Square's "Live at Larkin!," the Brotha Perry Organ Quartet plays at 5 p.m., followed by the Buffalo Afrobeat Orchestra at 6:30 p.m. Free. At 7 and 9 p.m. July 26, Pausa Art House (19 Wadsworth St., 697-9075) hosts the Andre Killian Duo, featuring drummer Abdul Rahman Qadir. $20. July 27: Walter Kemp 3oh!, with RiShon Odel and David Hulett plays at 8:15 p.m. at Hallwalls Contemporary Arts Center (341 Delaware Ave., 854-1694); $25. The Otis Brown III Trio performs at 7 and 9:30 p.m. in the 9th Ward at Babeville (341 Delaware Ave., 852-3835). $30. 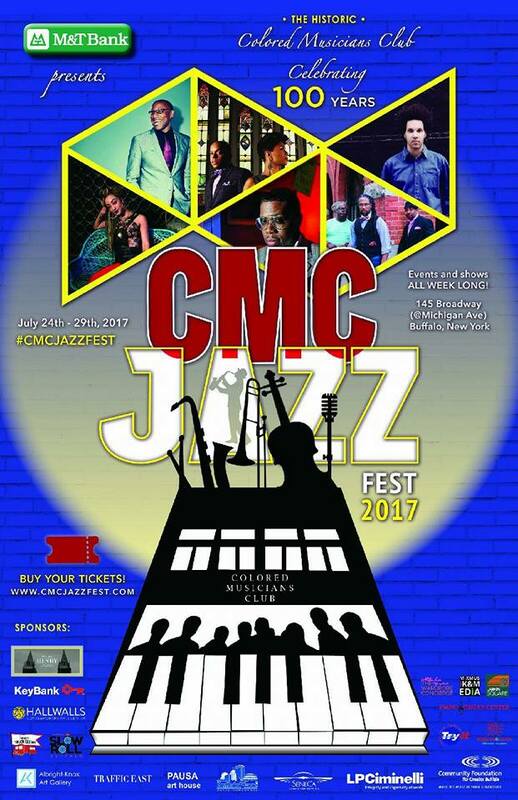 July 28: "Funk-n-Soul Friday" at the CMC. At 7 and 10 p.m., A2Z takes the stage. The group features Zuri Appleby, Arianna Powell, Rod Bonner and Daniel "DP" Powell. $25. July 29: Enjoy free music all afternoon inside and outside the CMC. The All City Jazz Band, high school musicians, start the festivities at noon. Why Not? follows at 1 p.m., and Blue Note 5 plays at 2 p.m. Singer Katy Minerleads a quintet at 3 p.m., and the Greg Millar Quartet performs at 4 p.m. At 5 p.m. it's a quintet led by singer Janice Mitchell. Pianist George Caldwell and his quartet play at 6 p.m. Inside the club, The Barbara Levy Daniels Quartet performs at 1 p.m., Trio Payazzo at 2 p.m., JazzWizz with guitarist Dennis Warne at 4 p.m., and a quintet led by pianist Les Davis, an anchor of the club, performs at 5 p.m. Finally, at 8 p.m. July 29, the Albright-Knox Art Gallery welcomes the Baylor Project, Jean and Marcus Baylor. Tickets are $39.